SCVHistory.com | Film-Arts | Biography of Daniel M. White, Screen Actor. Biography of Daniel M. White, Screen Actor. By John F. White (Grandson). Dan White was born on March 25, 1908 to George and Orpha White, about one mile from the Suwannee River in Falmouth, Fla. Falmouth was a small, sleepy town then, as it still is today. He was one of 12 siblings who were moved to Lakeland, Fla., sometime around World War I. Lakeland is where Dan was introduced into show business in 1922 at the age of 14. He ran away from home when the show moved on, and traveled thousands of miles throughout the South in tent, minstrel, vaudeville and theater shows. Dan performed on stage with his brother Willard for nine years with a stock company in Tampa's old Rialto Theater. Actress Frances Langford worked with him during this time, and it was Dan who told her to go to Hollywood. During this period he met Matilda "Tilda" Mae Spivey on the stage, and married her on Feb. 25, 1933. Tilda had a 2-year-old child from a previous marriage by the name of Arthur "Art" Grant Gifford. Times were tough, so Dan had to get out of show business for a while to make some real money. In 1934 he found work with the Conservation Corps in Homestead, Fla., but show business was always in his heart. Dan knew he had what it took to "make it" in Hollywood, so he decided to make the move to California in 1935. They packed all their possessions into their Ford and started the long, arduous trek across the country. This was during the Great Depression, and money was very tight. They had to stop frequently in various cities across the country to make extra money to continue their journey. Dan was a very good auto mechanic and never had a problem finding this type of work wherever he went. This paid off once during the filming of "To Kill a Mockingbird": During the "mob" scene, one of the cars they were to drive away in would not start. Dan opened the hood, stepped onto the front bumper, and had the car running in no time flat. 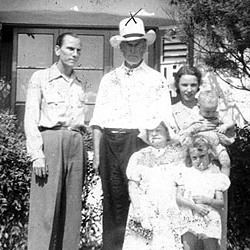 Dan White (left), William S. Hart, Dan's wife Tilda and their youngest son Curt and daughter June (bottom right), with a woman identified as Tex Cooper's wife, around 1944-45. Click to enlarge. They lived in Panama City, Fla., and Shreveport, La., for a while. By the time they reached Texarkana, Ark., in January 1937, they had to stop for a different reason. Tilda was carrying their unborn child, and it was showing signs that it could wait no longer. Tilda's sister Mary happened to live in Texarkana, and they were able to stay there for a few months until the baby was born, and big enough to travel. Their daughter June Larue White was born Feb. 14, 1937. On April 1, 1937, Dan, Tilda, Art and June continued their journey to Hollywood. They arrived 16 days later and found a house to rent just an eyeshot away from the HOLLYWOOD sign. They lived in this house for 23 years where many movie deals were made, and scripts were written ... right in their own living room. Upon arrival in Hollywood, Dan had a hard time finding work and found himself down in Panama working on the Pan American Highway for six months. When he returned home in 1938, he found work with Republic Pictures Corp. He made at least six movies with Republic in his first year alone. His first known film was a Western titled "Prairie Moon" with Gene Autry. Dan made $55 a week working on this production. Over the years in Hollywood, Dan claimed to have made nearly 300 films and 150 television appearances. About 70 percent of these were Westerns. Among his most well-known pictures were "The Yearling", "Distant Drums," "Red River," "To Kill a Mockingbird," "Gone with the Wind," "The Grapes of Wrath," "Giant," "Duel in the Sun," "Four Faces West," "Jailhouse Rock," "Touch of Evil" and many more. Somehow during all this filming, Dan and Tilda found time to have their third child: Donald Curtis White was born Nov. 9, 1941, just 28 days before Pearl Harbor was bombed. Of course, the films that made Dan famous were his numerous appearances in B-Westerns where he played the villain or henchie. His tough, high-cheekboned face with its tight-drawn, expressionless mouth and snake eyes chilled the blood of many a Saturday matinee-goer in the 1940s and '50s. Dan loved his work, especially all of his "outdoor" pictures. "Western pictures took people into the outdoors," Dan once said in an interview conducted in 1974. "Western pictures are Americana. ... This stuff really happened. The James Gang, The Hole in the Wall Gang, they were all real." Dan also recalled, "What you saw in a Western picture, we actually had to do. In those days you had to do all your own stunts. I had four men killed right beside me once! And in those days you went behind a rock to change ... a far cry from the portable dressing rooms of today." Dan's movies were filmed all over the country, but most were shot on location all around the Los Angeles area, especially in the Santa Clarita Valley. You didn't have to travel far in those days to find a location suitable enough for a good B-Western movie. Many films were made at the Monogram Ranch, also known as Melody Ranch in Newhall, Calif. Newhall was a great filming location, and a bulk of Dan's Westerns were filmed here. His filming in Newhall wasn't limited to just Westerns. He also appeared in "Suddenly" with Frank Sinatra, filmed on San Fernando Road in downtown Newhall. In the 1950s and '60s when the films started to "dry up," Dan turned to television. He was in numerous episodes of "Gunsmoke," "The Virginian," "Rawhide," "The High Chaparral," "The Californians," "The Rifleman" and many others. He was offered the role of Sam the Bartender in "Gunsmoke," but he didn't want to commit to something like that. He told his best friend Glenn Strange to apply for the job, and the rest is history. Dan lived in California for almost 40 years but his real love was Florida, where he grew up. Upon his retirement, he returned home to Tampa, Fla., just down the street from the old Rialto Theater where it all started. He made appearances in "Western Film Round-Ups" and television talk shows, and was frequently visited by his family in California until his death on July 7, 1980 at the age of 72. Dan left behind three children and 12 grandchildren. Today he has seven great-grandchildren who are constantly reminded about their great-grandfather every time he appears on the television ... which is a weekly ordeal in my home. Not only will he be recognized and remembered for all his films, but he will also be remembered as a great father and grandfather. He will be missed and loved forever.